Italian women bound into a flurry of baking activity before big holidays like Easter and Christmas. Then they rush their baked goods to friends and family, as though the holiday will not happen unless every last baked good is delivered. A week before Easter my mom went into production on rice or pastina pies (a Neapolitan tradition) and Easter Bread. 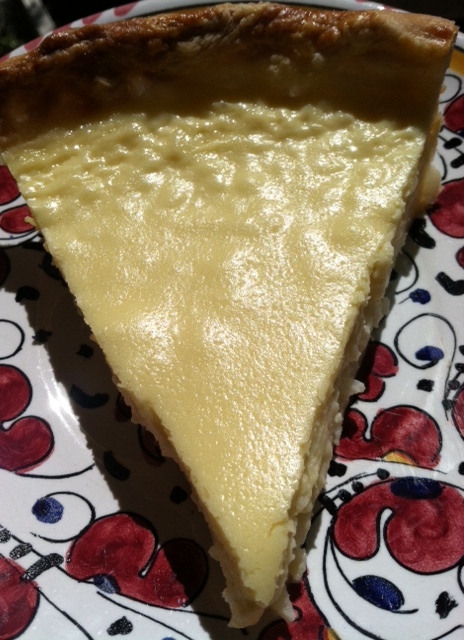 The creamy pies, are almost like custard pies only with more substance. They’re, made of rice, cooked with lemon and orange rind, vanilla, milk, eggs, sugar and more. The bread is a sweet bread drizzled with icing and decorated with nonpareils (colored sprinkles). 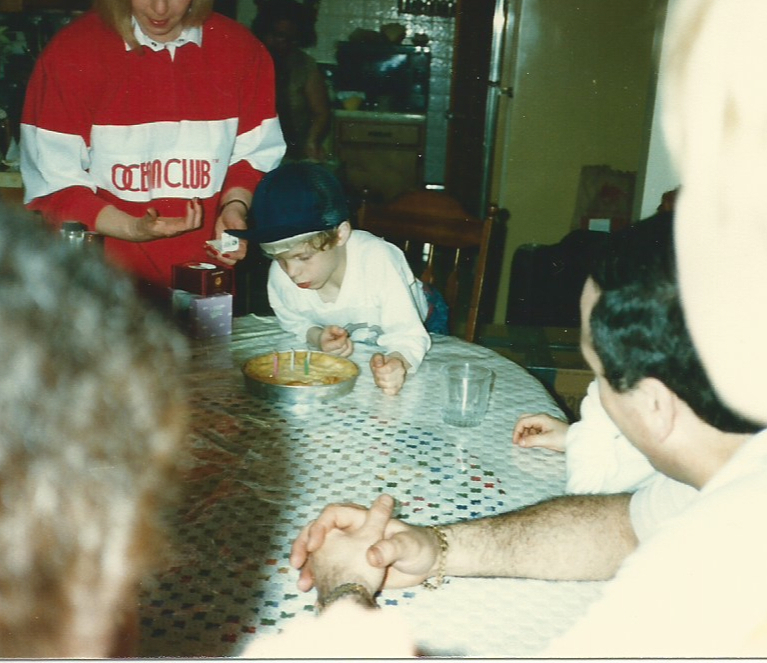 My nephew Patrick (years ago) celebrating his birthday with a Trader pie. My mom, her sisters and her best friend, Angelina, each baked pastina pies, then delivered them to each other’s homes before Easter. 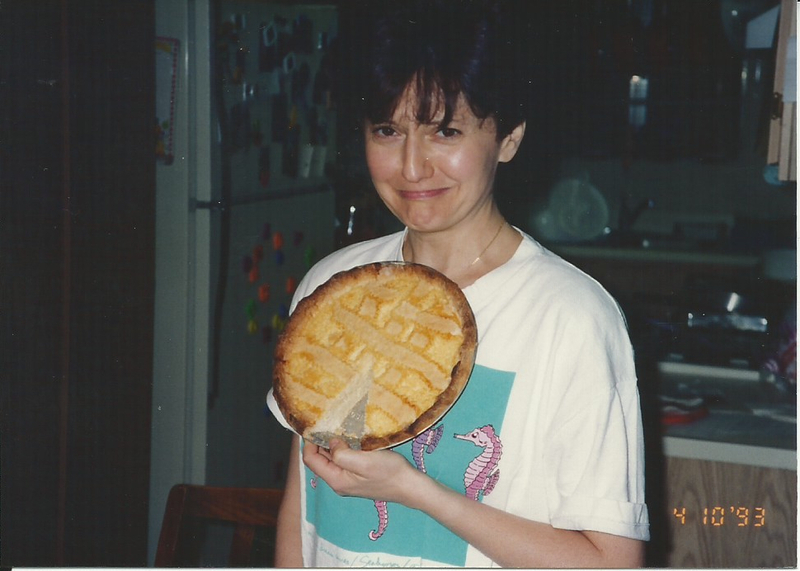 My dad or brothers had to cart my mom from one house to the next, pies in hand. She left with her pies and came home with pies from her sisters and Angelina. The disrespectful name, Trader Pies, was given them by my brothers, and it stuck. Fran, years ago, with disastrous, shot put Trader pie. Beware though, do not leave the Easter bread with coconut on the table overnight when a young, untrained chocolate lab is around. Our lab, Cosmo was apparently overcome one year by the awesome smells early one bright Easter morning. My then husband awoke to the sound of tinkling. When he went into the breakfast nook where the lovely breads had been sitting, he saw it was Cosmo’s metal ID tags jingling against the plate as the dog wolfed down half my beautiful braided Easter bread. He came in and told me my mom must have wanted a taste, so she possessed Cosmo’s soul for Easter. I wanted to strangle the dog, but I guess it was a compliment. This recipe is falling apart, but I could never part with it. You can knead in raisins if you want. 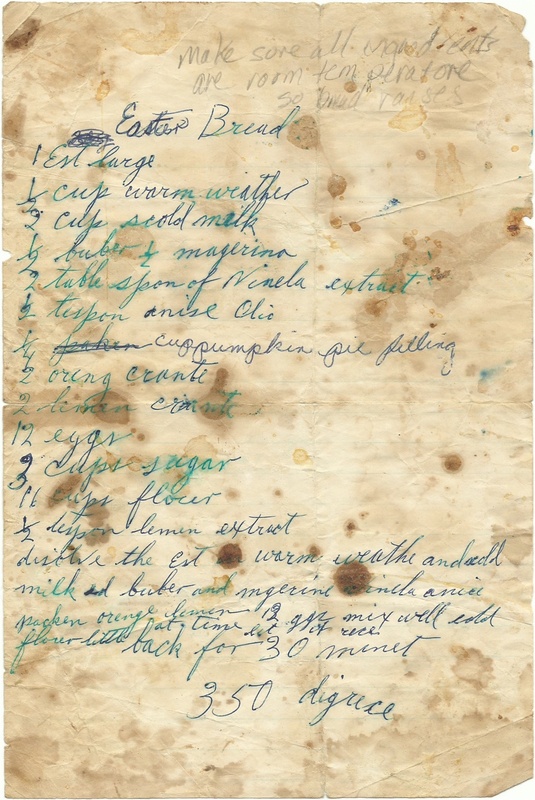 I was going through my recipes and was thrilled when I found this old tattered one of my mom’s for Easter bread. I can’t wait to use it! I wanted you to see how well used it was and how interesting her take on spelling was. God I miss that woman! I miss my role as sous chef, stirring the rice in the giant pot on the stove for her. I miss the gleam in her eye and the sly smile on her face as she decided to add blasphemous chocolate to her Trader pies. And I miss the stunned look on her sister’s faces when she showed up with maverick chocolate pies. She made holidays fun. est = yeast, weather = water, scold = scalded, buber = butter, magerina= margerine, vinela = vanilla, oreng crante= orange rind, picken = pumpkin, minet = minute. Anise olio is anise oil, but you can use anise extract, probably 1 teaspoon for this recipe. Start checking the bread for doneness after about 1/2 hour. Good Luck! And dammit, I wish I lived closer to my family so I could bake and trade with them. Usually we just call each other the night before Easter, as we have a glass of wine and bake our pies. Sometimes secret ingredients slip out under the influence, like the year Uncle Bob confessed he added marshmallow fluff. Could a Nutella Trader pie be next? Maybe I’ll get crazy this year…who knows? 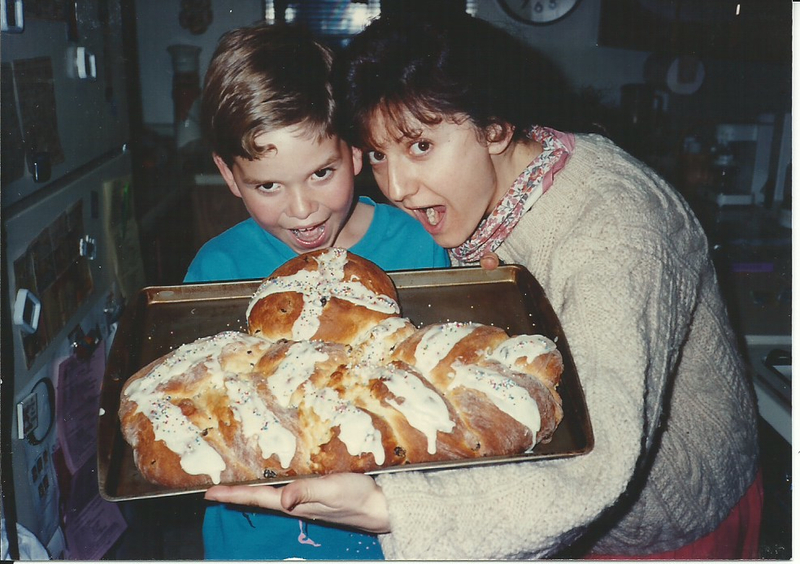 Me and my step-son, Brandon, many moons ago excited over our Easter bread. Kids can’t be left alone with the bread either, they eat all the icing off. You don’t have to be a genius to bake these pies or the bread. It takes a little time, but it’s worth it and it’s a nice tradition. If it turns out good you can send one over to the neighbor. If it turns out bad, just fling it at someone you don’t like. But chances are, the dog might go for it. I think any tradition that inspires giving, self-defense or possession of your family pet is a good one. Pour yourself a glass of wine, try these and let me know how it goes. For this recipe, I consulted Angelina Belculfine and her sweet daughter, Theresa. Angelina was my mother’s best friend and the only woman whose pies my mother ever admitted were better than her own. I also consulted Aunt Blanche and Uncle Richard who took mom’s recipe and personalized it. And, of course, I tweaked it. My Trader/Pastina pie this year with regular pie crust. It turned out creamy and wonderful. Mix together all dry ingredients then add Crisco to flour mixture. Make a well in the flour and Crisco mixture and drop in eggs. Add milk a little at a time until mixture is the consistency of soft dough. Dough will be softer than regular pie dough. Set a small amount of dough aside to make strips to put on top of pies. The dough just flops over the custard filling about an inch on the sides. So you have to fill the pie with filling first, then fold over the edges and lay the strips on top of the liquid filling. Generously flour surface then roll dough out for bottom crust and put it into greased pie pans. (This dough is notoriously hard to deal with, so don’t worry if it falls apart, just patch it together and move on. Cook this mixture for about 15 minutes. (Note: Make sure mixture is cool before adding eggs or they will cook as soon as they hit the hot mixture. Remove a little of the rice-milk-cream mixture and stir in the eggs first, then slowly add it to the rest of the cream mixture.) Remove from heat. If you want to get radical and try the chocolate I would probably omit the lemon rind and lemon extract. Then just melt 1/4 to 1/2 cup of chocolate chips (my mother would have used Nestle, but you can use some other brand like Scharffen Berger) and mix it with a tablespoon or two of milk or whipping cream, then add the chocolate to the rice mixture. Taste for sweetness once chocolate is added. If necessary, add more sugar, a teaspoon at a time. Then pour the rice-cream mixture into the prepared pie crust. and bake at 350 for about 20 minutes or until lightly browned and not watery in the middle. Do not overbake! If using regular pie crust, cooking time may be slightly longer. And below is the Finnish Spring Bread recipe I used for Easter Bread before I found my mom’s. It is really good! I found this recipe in an ad for Fleischmann’s yeast years ago and love it! But now that I’ve found mom’s, I’m using hers. This entry was posted in Awesome Breads, Great Memories and tagged Baking, Easter, Easter baking, Easter bread, Easter traditions, humor, Italian Easter tradition, Italian humor, Italian traditions, pastina pies, trader pies. Bookmark the permalink. Fran, can you post the recipe for your mothers Easter bread I cannot read her writing thank you kindly! Hi Tanner, I will do my best to decipher it and get a copy on the site. Trust me, you’re not the only one who can’t read her writing! Or, once I figure it out, I’ll just email it to you. She used to put pumpkin in her Easter Bread, not sure why, but it was always delicious, so maybe it gave it some moisture. Not sure. Anyway, I will do my best for you. But it may take a few days to a week. I hope that’s OK. The other bread recipe that I did post is excellent and always turns out great for me. OK Tanner, here is the recipe for my mom’s Easter Bread. Mom’s Easter Bread. Good luck. Let me know how it turns out. Dissolve the yeast in the warm water mixed with warm milk. Add the butter, the vanilla, anise oil or extract, pumpkin, orange and lemon rinds, the salt (be sure mixture is cool enough, then add the 12 eggs. Mix ingredients thoroughly and then add 8 cups of flour slowly. Place the other 8 cups of flour on a clean mixing board or table to mix the dough together. Once the liquid mixture gets pretty thick as you add the flour, scrape it out onto the floured board or table. Knead in the flour until the dough no longer picks up flour. You should knead the raisins into the dough now. Grease a large bowl with canola oil and place the dough in, rubbing the top of the dough with oil so it doesn’t dry out. Then cover the bowl with a clean towel and place the dough in a warm dry place, letting it rise for an hour or until it’s doubled in size. Once it’s risen, take the dough out of the bowl and shape it as you like. You can separate it into several sections. You can braid it, or make balls of dough and put the dough in greased pans. Cover the dough again and let it raise another hour. Then bake it at 350 for ½ hour or until golden brown on top. When done, drizzle with vanilla icing and sprinkle with non-pareils. I don’t-a make-a pies because I be a lazy, no-good pie-less gal. Dissa so true about me and it’s been well documented that though I have baked up a storm in my lifetime, I have never made-a the from-scratch pie crust, and I am so shameless as to have no remorse about it. I sure do wish though, that you lived down the street from me and dropped one of those pies off at my house! You’ve got my mouth watering! Sadly, I would have no Trader pie to offer you in return, but feel free to drop off your laundry because the fact is that I have a decidedly unhealthy pleasure in laundering clothing (and ironing) and will happily spend oodles of time bustling around the washing machine. My mother tells me that I should take in the neighbors’ dirty clothes and have a real wingding time of it. I have to say that I gained my love of doing laundry from my mother, who loathed the task and did as little of it as possible (as a child I occasionally outgrew clothing before I ever saw it returned to me clean… once tossed into the laundry basket, hell might freeze over before one ever saw their favorite pair of flowered bell bottoms again). My mom excelled at many things, but laundry was not one of them. While most children had visions of sugar plums dancing in their heads, as a wee one I had visions of being grown-up enough to reach the top of the washing machine and in fact I even dreamed of having my very own washing machine (as things go, early in my married days I, of course, did procure a machine and practically threw my bony little arms around it in a fond embrace…. all white gleaming enamel, beckoning me into the glory days of clean clothes, whenever I wanted them… sigh). Ah, but I digress (as I often do — could be the laundry detergent fumes), so let me just say that your pie recipe sounds absolutely outstanding and I hope that you enjoy your Easter treats with gusto. Here’s to the sweet and hilarious memories of our mothers, the annoying memories too, which are now only hilarious… they’re all wonderful. Thanks for another lovely post, and mouth-watering at that! Oh Leslie, my mom was the same way with laundry too, honestly, it would be months before clothes came back, but look at how self sufficient it made us! Too funny. Thanks for reading and writing! Wish I did live closer, I do have some pie leftover and it needs a home! Yes, I do indeed thank my mother for my love of doing laundry. Who knows…. if she hadn’t been such a delinquent laundress, perhaps I would not have a home brimming with clean clothes in my sage adulthood. My mother excelled at many, many things, none of which was laundry, and I have to say that I always admired her leadership skills and dedication to the many volunteer jobs that she held which made our lives happen (PTA President, Camp Fire Girls leader, and many more). So there you go — it does indeed take a village, and thankfully we can all grow up in America with the brilliant freedom to do our own laundry. Life is good. Love you my little Nicol. Thanks so much for always reading and being a wonderful friend! And have a wonderful Easter! 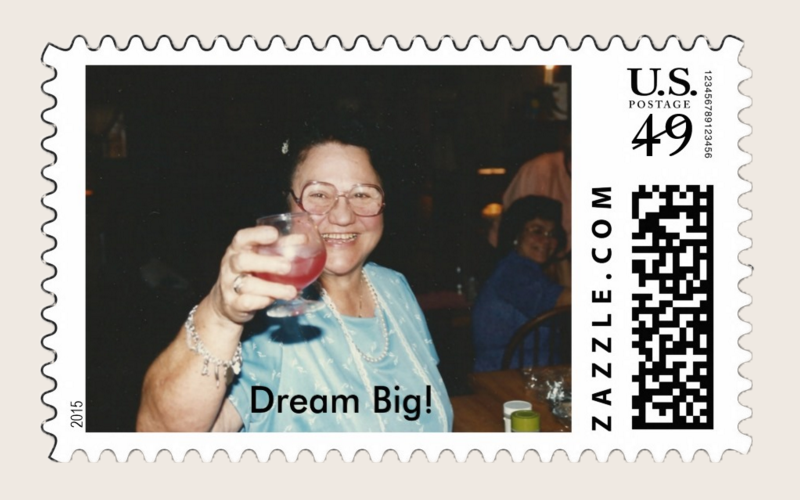 Franzie, you make me Miss my Mama!….but i’m moving back to Oregon soon because it’s Time and i Want Time with my blessed folks. My Mama spells like yours, but with the Eastern European twist. And she makes darn fine holiday bread too! I’m going to sent this post to her and my sister. As always, i Love you words. And i love Your family!! and ps (You could maybe freeze a tiny slice of the pie, or bread…maybe). Matilda, i would be delighted to do that for you! I wish you and your wonderful family a fabulous Easter! We must talk, I need to know about this departure from L.A.! Oh Monica, that is music to my ears. Thank you, I’m glad I gave you a laugh today! Happy Easter! Fran, your posts consistently make me laugh out loud. The best part of this one was the translations from your mom’s bread recipe (best one- scold for scalded)- good thing you added those, who knows how the bread would turn out without them!